I just launched a comprehensive Laser Hair Removal Clinic Directory including listings in all 50 USA states. I am very happy with my results from my 4th laser hair removal treatment.� I haven’t shaved yet, and it has been seven weeks since I was treated.� There is a little bit of hair growth, but you can’t see it unless you look in a magnifying mirror.� Most of the hair growth are fine blond hairs, which will not be killed by laser hair removal.� The areas that I had to have re-zapped still haven’t fully shed.� I’m not sure if they will, maybe as the technician said they are on different growth cycles. Read more details about my laser hair removal. I had my first laser hair removal treatment at 10 J and 18 mm on the Candela GentleLase. These were the recommended settings for a person with Type III skin type. Turns out I’m a type II, so I should have started at 14 joules. BUT now Ideal Image is starting type II patients at 18 J!!! I’ve had four treatments already and I haven’t even reached 18 J.
I found this information out when I went back to have a couple spots re-treated. I thought these areas were missed, but the tech thinks they may just be on a different cycle because it was the same area I had to have re-touched last time. Well, she treated me anyways, but only at 16 joules. She says my 5th treatment will be at 18 joules. hmmmf Now I think my laser treatments will not be as effective as they should be. Other then this new treatment guideline, I am happy with my treatments. Five weeks after my 4th treatment my skin was hair free! I do have pepperspots, but no hair growing. Three weeks after my 4th laser treatment and the hair has shed, but I am left with dark pepperspots.� Instead of the hair being completely pushed/pulled out of the skin it broke off, just below the surface, and left behind little pieces of hair.� The highly visible pepperspots will not go away!� I have tried using scrubs, soaking and applying lotions, but nothing removes these ugly little dots. I know they will go away eventually, so I’ll just have to wait it out. I started shedding right on schedule, exactly 8 days after my fourth laser treatment.� I was a little worried because my hair appeared to be growing more slowly than usual.� It may just be the cold weather. 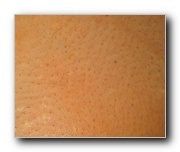 �More details & pictures of hair shedding after 4th laser hair removal. My fourth laser hair removal treatment was at 16 joules. The spot size used on my upper lip was 15 mm, but the bikini and underarm area were treated at 18 mm. I was extremely red and a little blistered after the treatment, but aloe made all the blisters and redness fade in a matter of minutes. A few hours later some redness reappeared, but the next day that was gone too. I developed tiny red dots around the hair follicles in my underarm and upper lip. Those red dots are a good sign that those hairs have been burn to dust! The red dots lasted for 24 hours. 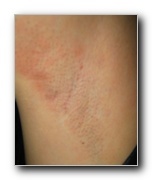 See pictures of red and blistered skin after fourth laser hair removal treatment. Read details of my fourth laser treatment. Most of the hair grew back within 12 weeks after my third laser hair removal treatment.� The most noticeable results are in my underarm area.� They are easy to shave and there is a lot less hair.� My upper lip has slightly less hair, but I wonder if it would return in time.� My bikini area is thinner, but I’m disappointed there isn’t more of a difference.� I am upset that my first three treatments were at very low settings. It has been five weeks since my last Laser Hair Removal treatment.� My skin is smooth except for a few blond hairs. The spots that were re-treated at 14 J are now completely hair free. — Which is great because I was afraid these spots may be immune to the powers of laser. LOL Even my upper lip is looking great with just a little peach fuzz left behind. See pictures of my bikini, underarm and upper lip area after 3 laser hair removal treatments. Three weeks after my third laser hair removal treatment the shedding was complete and my skin was nearly hair free. I did have to have a couple spots retreated, and that is what led to my discussion with the tech about the settings used on me. I was treated at 12J & 18mm on the GentleLase by Alexandrite. I had the touch up at 14 joules and want the 4th laser treatment at 16 Joules. The RN explained to me that it could be dangerous to jump from 12 to 16 joules, even though I had the spot treatment at 14 J. She said you never know how each little piece of your skin is going to react, and suggested I talk to the MD if I wanted to increase my settings. — I’m not really sure what to do. See pictures of hair free skin after three laser hair removal treatments. My hair began to shed five days after my third laser treatment. It took eight days for me to notice any shedding after my first two treatments; I wonder if the higher energy settings caused the hair to react more quickly. I have read online that 12 joules at 18mm for my skin type (type II) is still too low, and I should have treatments at 14 or 16 J, then move up from there. I am still concerned about burning, but I do plan on researching this more. Read details and see pictures of my bikini, underarm and upper lip shedding. My third laser hair removal treatment was extremely painful. The energy was turned up, so I was treated at 12 joules instead of 10 joules on the Candela GentleLase by Alexandrite. I became very red from being zapped by the laser, but after I applied aloe the redness faded. It wasn’t until an hour later that the redness reappeared, but only slightly. I had to apply aloe every few hours for about two days, until the skin became normal again and the pain stopped. The after treatment pain was very similar to a mild sunburn, so was the coloration. Read details and see pictures of my third laser hair removal treatment. I was suppose to have my third laser hair removal treatment 8 weeks after my second treatment, but I had to cancel and there wasn’t another appointment time available for two weeks. During that tenth week I had an enormous boom in hair growth. After reading more about this, I have learned that many people recommend 10 to 12 weeks in between appointments because that is when the hair that was only temporarily damaged starts to return. I am very disappointed because I had thought I was having great results from my laser treatments, now I’m not too sure. I guess I’ll have to keep hope, after all I’ve only had 2 of the 8 needed treatments. Read details and see pictures of hair growth boom. It has been just over a month since my second laser hair removal treatment and I can see a difference in the amount of hair in my upper lip, underarm and bikini areas. The most noticeable change is in my underarm area. It is so easy to shave! I do have to shave my underarms everyday, but it is easy. I only have to swipe the area once. Prior to the treatments I spent a lot of time shaving my underarms, turning the razor in every direction and pressing down with varying amounts of force. Before I started the treatments shaving my underarms was like a science, now it is just a normal grooming process. Read my complete journal entry for Visible Hair Reduction. One month after my second laser hair removal treatment the hair began to grow back.� In my bikini area there are several long hairs, and small patches of short hair growth.� I’ve had to shave my underarms three times in the last week, and my upper-lip hair is a little noticeable.� Read more details about hair growth and see pictures of my upper-lip, underarm and bikini area one month after my second laser hair removal treatment. My bikini area stayed nearly hair-free for 10 days without shaving. I am very pleased with the results of laser treatments in my bikini area, but the results are not as visible in my underarm and upper-lip areas. My upper-lip did not have a ‘hair-free’ week. The last treatment seemed to have very little effect on my upper-lip. The underarm area is much better than before I started the treatments, but not quite as good as my bikini area. Read more details about this laser hair removal journal entry. I was able to go eight days without shaving my underarms.� They are very soft, but if you look closely you can see small, light colored hairs.� The entire shedding process took about two weeks, but I didn’t get the hair-free week I experienced after my first treatment.� I believe my settings need to be increased from 10 joules to 12 joules.� See more pictures of my upper-lip, underarms and bikini area after shedding. The hair in my bikini area started to shed eight days after my second laser hair removal treatment, but very little. On the 11th day after the treatment a lot of the hair began falling out. I do not have any pepperspots; a pepperspot is a small piece of hair that stays in the skin and creates a black dot. Click here to read more details about my shedding process and to see more pictures. Five days after my 2nd laser hair removal treatment and my hair continues to grow as normal.� However, it is very brittle.� I can pull it out of my skin with just my fingers and it breaks apart very easily. See more pictures of hair about to shed. My second laser hair removal treatment was uneventful.� I applied the numbing cream 45 minutes before the treatment, but I don’t know if it really made a difference.� The treatment was painful, but not unbearable.� My underarm, upper lip, full bikini area and areolas were all treated in about 20 minutes.� Again, there really wasn’t any redness after the treatment. I purchased the numbing cream for my bikini area.� It was only $10.� The pharmacist said not to apply it to more than 50% of your body, but the clinic said not to apply it to more than one area being treated, so I will only use it for my bikini area. I also added a treatment area to my package – the perianal will cost another $695.� Read full details of numbing cream and perianal cost. Normal Hair Growth, Shaving Daily Again. My hair started to grow normally six or seven weeks after my first laser hair removal.� There does seem to be less hair in the treated areas of my bikini area compared to the odd patch near my mole that wasn’t treated.� I have to shave my underarms everyday and my upper lip doesn’t look any different than before I had the treatment.� Read more details and see pictures of hair growth after my first laser treatment. I had the mole in my bikini area removed so that it would not interfere with my laser hair removal treatments.� You can not zap a mole with the laser because the dark pigments in the mole could attract too much heat and cause burning.� During the last appointment a significant amount of hair was not treated around my mole, so I opted to have it removed.� I am concerned about scarring, but the dermatologist said there would be little if any discoloration or scarring.� See before and after pictures of the mole removal. My hair returned five weeks after my first laser hair removal treatment. My upper-lip is almost the same as before the first treatment. My underarms have a lot less, but the most noticeable difference is in my bikini area. My bikini area looks as though it was waxed about a week ago. Shaving is much easier, but I’m looking forward to not shaving at all. Read more details about hair growth after my first laser hair removal treatment. Many people say they have a few weeks of smooth hair free skin after shedding, but my hair-free time only lasted a week. After that the hair grew in very slowly, so I was pretty happy with the results. I did have a lot of in-grown hairs, but I always do so this isn’t anything new. Most of the hair had shed within two or three weeks, but there was a small patch that didn’t seem to shed near my mole. I hope to have the mole removed, so it won’t interfere with my laser hair removal treatments. Read the full journal entry for the week of hair-free skin. My first laser hair removal treatment was very easy. Surprisingly there wasn’t any pain. The settings were very low. I was treated at 10J 18mm on a Candela GentleLase. I had my upper lip, underarms, bikini area and areolas treated. The treatment took about 20 minutes and most of that time was me getting dressed and undressed. I took pictures right away, but they didn’t come out very well. The pictures do show that my skin was white without the slightest sign of skin irritation or burning.� Read more details about my first laser hair removal treatment. I went to a chain laser hair removal clinic called Ideal Image to have my free laser hair removal consultation. I hadn’t planned on signing any contracts or setting up an appointment for my first treatment, but things went so fast the next thing I knew I had signed a contract. I suggest everyone have at least three consultations before deciding where to receive laser hair removal treatments, fortunately Ideal Image has a good reputation, they use the best lasers, but they do charge a little more than other clinics. I am having my upper lip, my bikini area and my underarms treated for $3,000. I will be treated with the GentleLase Alexandrite laser by Candela. There will be 8 treatments spaced 10 weeks apart. I took before pictures of my upper-lip, underarms and bikini area, and I will take more pictures after each laser treatment. I hope this journal helps people understand the laser hair removal process. When I looked into starting treatments I was disappointed by the experiences published on the web, so I created a laser hair removal journal with before and after pictures of every phase of my laser hair removal process. I am having my upper lip, underarms and bikini area treated by a Candela GentleLase Laser at Ideal Image. I will try to make weekly updates, but when it becomes repetitive I may only update twice a month. All of the pictures are linked to a page with a larger picture. So if you want to see details and all of the fine hairs click the thumbnail pictures for a close-up. This page is a quick overview of each entry. If you would like to see more details of each treatment read my laser hair removal journal entries.